Florida Real Estate: Waterfront Home For Sale In Jensen Beach! 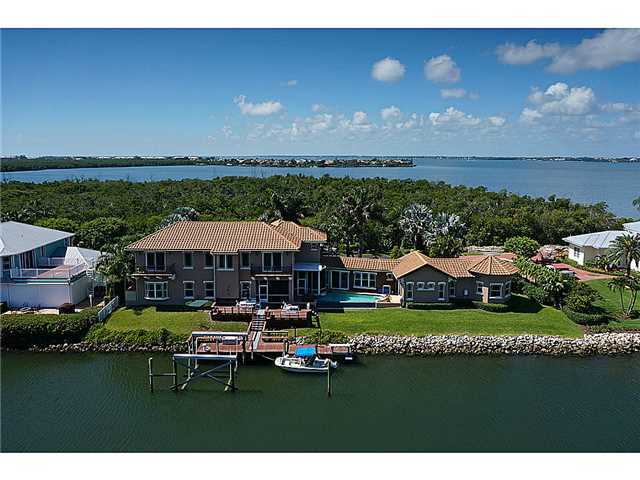 This magnificent waterfront home with wide intracoastal vistas is a must see in Rigel's Cove in Jensen Beach. This four bedroom, three full bathroom, and one half bathroom home is generously laid out of almost three thousand nine hundred square feet of perfectly appointed living space. This is on protected deep water and has it's own private dock that can accommodate a forty foot boat weighing up to a twenty seven thousand pounds on it's own lift. This home sits majestically on one and a half lots. The chef's dream kitchen features marble counter tops, a wine cooler, a full suite of stainless steel appliances, a spacious breakfast bar and hand crafted custom cabinetry. The flooring throughout the main living areas are a beautiful polished marble. The backyard oasis is boasts a sparkling infinity swimming pool and spa overlooking the water and a summer loggia to entertain and cook for your guest while enjoying the outdoor breeze. The master bathroom showcases a granite bathtub and steam shower. This is the perfect home for the water lover! 4127 Ne Rigels Cove Way located in Jensen Beach and is currently asking $1,650,000.00.